Lol! Those are the cutest things ever! You could make a sorting activity with the cups, too. I'll have to keep an eye out! How about trying a party store. Where I live, we have "Party City". May find them there. You can order them from Oriental Trading. They are with the Luau party stuff. I'm so making these!!!!!!!!!!! Love them!!! I will be ordering them for my team!!!! I just found these cups last night at our Dollar Store. They were in the Hawaiian Luau section. There are 2 in a package. The letters will need to be attached as there is some decoration that you may want covered. I want to make them, but I just need an idea to go with them. The cups are not that big so not too much could fit for sorting. If you or anyone else has an idea for word study activities for 3rd grade, I'd appreciate it. How do you make the feet? What are they make of?? Love the idea, don't know how to make them. 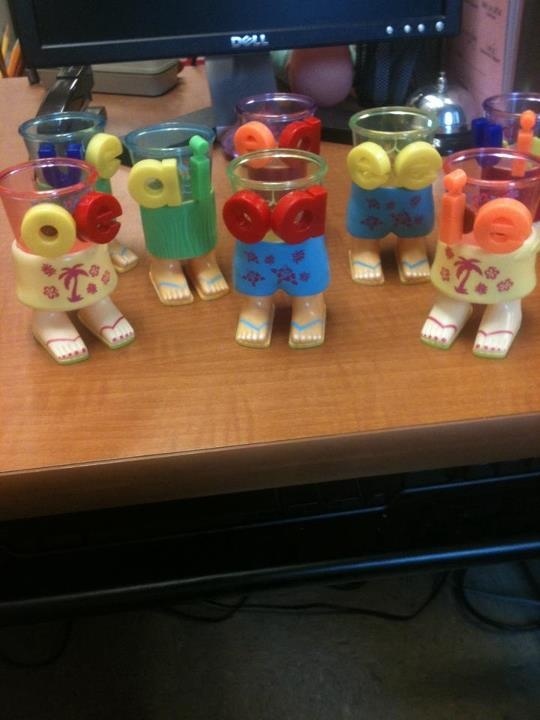 I didn't make these cups. I found them online. They are actually cups though. I went looking for them last summer and couldn't find them anywhere though.